I’ve been pursuing book cover design in the past year because in a small publishing house like Ooligan Press, book covers play more significant roles than in large publishing houses that hold big name authors and titles. I am interested in the effects of book cover design on consumers who do not know the author or content, and what information a book cover should include in order to attract consumers. What happens when the book you’ve written doesn’t neatly fit into one specific genre? For instance, what if instead of a book that falls unquestionably into the mystery thriller category, you’ve written one that beautifully straddles the line between personal memoir and war memoir? While this question can certainly influence any number of factors in the book publishing process, it comes into a particularly important light when a publisher begins to develop the marketing plan for a new book. 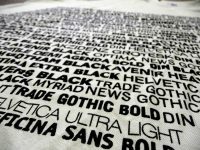 Many of us associate certain typefaces with specific situations or ideas—Times New Roman is generally used for anything academic or professional, Courier is reminiscent of old typewriters, and Blackletter or Gothic script makes us think of newspapers. Before I dive into the complex world of book covers, I should confess that my rudimentary and frankly half-hearted initial search quickly turned into a passionate and intense hunt for cultural trends, typography, and design. It turns out that book covers are fascinating and not altogether unlike clothing fashion. Just as I wear styles first adopted by fashion icons who convince me of their chic-cool factor (I’m looking at you, overalls and turtlenecks), there are design bandwagoners for book covers as well. With the rise of global warming, natural disasters are becoming more and more common. As a new student to publishing, and as someone that wants to continue in this field, I’m left to wonder how this multi-billion dollar business can help. After the recent hurricanes that have devastated Puerto Rico, the publishing industry is taking a stand to help. #PubforPR (Publishing for Puerto Rico) was an auction held in the wake of hurricane María. Auctioning off everything from signed books to custom artwork, the auction received over 4,500 bids with all donations going toward Unidos por Puerto Rico and ConPRmetidos. This willingness to come together and help led me to wonder what else the publishing industry has done to help with relief efforts.